There is a hint of snow on the wind on a gray morning that promises nary a glimpse of pale sunlight before nightfall. By February I will be royally sick of the dark and spiritually starved for light, but these first true days of winter are welcome, especially as we enter December and its homecomings and celebrations. We add layers and lay down extra fat in cold weather, and the foods I crave usually are preceded by the adjective "hearty". Just as poring over garden catalogs helps to bridge the gap between winter and spring, great food writing is one of the anticipatory thrills of the long dark season. So when I read something so toothsome and exquisitely described as David Churbuck's post On Chowder, it is a find too precious to keep to myself. Churbuck is a gifted storyteller, erudite yet down-to-earth, spinning a yarn with the precision of an awl through sailcloth. "Another memorable sight was the appearance of the evil meat grinder, a seldom used tool which was used to grind the clams into chowder-sized pieces. The Cuisinart has condemned the meat grinder to history, but nostalgia demands that I declare clams that are ground up by hand and not whirred into a formless paste simply taste better. A large Alzheimer’s-inducing aluminum pot, scavenged from some civil defense bomb shelter or army camp, was set on the stove. Into it went a pound of diced salt pork – fatback to be precise – a primal meat from the 19th century, when whalers would pack away barrels of the stuff to provide protein and hasten the arrival of scurvy during long voyages at sea. Every time I go to the grocery store looking for fat back I half expect to see it missing, discontinued because Ishmael has passed away and isn’t shopping at Stop & Shop anymore." Treat yourself to a helping of the whole thing. I have a predisposition toward Churbuck's tastes with my Buzzards Bay roots, which is also what initially drew me to the South African food blog Cook sister! with my years in that part of the world. The name of the blog comes from the delicious syrup-soaked fritters indigenous to both Afrikaner and Cape Malay cuisines, and the author is now an ex-pat living in London, an absence that gives her descriptions of the recipes of home an extra piquancy. 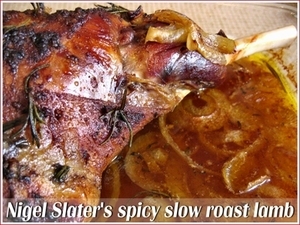 Today I found an exquisite paen to a succulent dish - slow-roast lamb - and a beloved cookbook by Nigel Slater from which the recipe is adapted. "When the weekend is cold and rainy and you have friends coming over for lunch, what can be more satisfying than a leg of lamb, rubbed with spices and left to cook long and slow, till the meat falls off the bones at the mere touch of a fork? Served on cunningly clever chickpea mash with paprika (recipe to follow in a future post) with honey glazed cumin carrots, it simply does not get better than this." 'You can't mix it with your hands, like a meatloaf. You have to get that ridiculous mixture into a recognizable ball, without touching it with human hands. HAND HEAT is the enemy of a flaky crust. 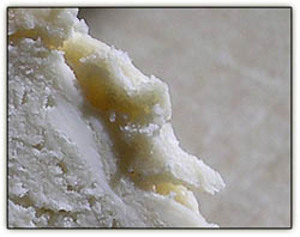 Close-up of the chilled ball shows butter (golden yellow) and lard (pure white) bits maintaining their separate identities within the dough, the secret to sublime flakiness. Instead of forming a spherical ball, next time we will flatten the doughball -- as our sis does -- to allow easier breaking apart for upper and lower crust and a head start in rolling, as well as quicker chilling (and thawing if dough is to be frozen for later use)." Fruitcake at Dum Luk's is nothing like the dreaded bricks of yore. "...the essence of fruit cake is the glacé fruit. This is a lengthy process of preserving fruit by replacing the moisture in fruit or peel with a sugar syrup. Traditionally this is strictly cane sugar and water transfused slowly over several days to preserve the texture of the original fruit. In US manufacture the process is sped by the admixture of corn syrup, dye, and the rest of the food chemist's bag of tricks. For more on the process see here. Dorothy's recipe calls for two pounds of glacéd fruit, plus a pound and a half, each, of currants and raisins. This, with a pound of coconut and a pound or two of nuts, is divided among eleven loaves and a modest round pudding basin. It makes for wonderful seasonal gifts ... always assuming that you are the sort who likes mostly people with a fondness for fruit cake. If they blench on opening, you have encountered one of the majority with no stomach for the crittur. Curiously there is no middle ground. No one can "take it or leave it alone" like Mr Thurber's bear. Growing up with the stuff, I belong in the minority who have a notion of what is good. At least I do when it comes to fruit cake." As one of the cook's many fans raves; "Anybody who puts whole Brazil nuts in fruit cake can't be all bad!" Maybe you can resist the recipes that these talented cooks and bloggers provide, but I find their writing evocative and delicious (and calorie free!). My brother believes that each slice of fruitcake should look like a stained glass window. EGAD . . . That comment allegedly posted by Webutante was actually posted by MOI! Thanks again. :-) I'm going to clip your nice words for my kudos column. Lamb doesn't seem to be a prized meat in the United States; that's plum pitiful. My stepmother/cousin owned a sheep farm in the Northern Neck of Virginia and my love affair with lamb and mutton started during my first visit when I was about six years old. Unfortunately, the sheep are now gone, as are most of the family. Thanks for yet another recipe, I'll let you know how it turns out.